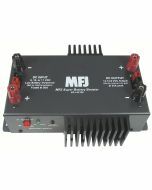 MFJ-4416BRC gives you full remote control of your MFJ-4416B or MFJ-4416C Super Battery Booster plus it allows you to monitor battery voltage and battery booster output voltage. You can place the battery booster near your battery or other convenient location. The MFJ-4416BRC lets you turn booster and low battery alert on/off. Has boosting and low battery LEDs. Includes four mounting holes. Just plug in Cat-5 cable to connect to battery booster. Measures a compact 5Wx2Dx3H inches.